Did you know over 10 percent of school aged children have been diagnosed with ADHD? The American Academy of Pediatrics recommends both behavioral treatments and medication for the treatment of ADHD in children. However, behavioral treatment is preferred for children under the age of 6. We address the topic in this interview with Dr. James Waxmonsky, division chief of child psychiatry at Penn State Health. Description – The video begins outside Penn State Children™s Hospital. Two individuals are standing in a garden area and in front of a glass window. From left to right is, Scott Gilbert and Dr. James Waxmonsky. Dr. James Waxmonsky – If we’re too busy, we’re sleep deprived and we haven’t had our caffeine, we’ll feel more inattentive or restless. That’s certainly true. So the key — you have to remember that ADHD is a disorder. And a disorder means that we struggle with something more than the average person in that setting our age. So, when you’re dealing with three-year-olds, lots of luck. They’re all generally going to be pretty hyperactive, and you’re going to have to repeat yourself. But once you get into a school setting where you can put a child next to 20 other kids their age and have them do tasks that are typically normal for the age like sit at a desk for 15 minutes, pay attention to a teacher while she’s talking, complete 10 minutes of math in a given timeframe, then you can start to see where these things might cause problems. So if you’re so off task, you don’t get your work done. You can’t hear the instruction. You’re so restless that you can’t stay in the seat or you’re disrupting other people around you, or you’re so impulsive that you’re having a much harder time managing your anger than another child your age, then we have a problem. And then that’s typically when the term ADHD might get used, and that’s and really only when we should consider treatment for the disorder. Scott Gilbert – And I hear ADD. I hear ADHD. Are the two terms interchangeable? Dr. James Waxmonsky – Largely. We used to have two separate, I suppose, diseases recognizing that maybe kids are purely inattentive are a little bit different than kids that are prominently hyperactive. It turns out they’re much more similar than they are different. So we tend to use the catch-all term of ADHD, but recognize that some kids can be more prominently or visibly inattentive where some kids can be more visibly hyperactive. Scott Gilbert – Dr. James Waxmonsky is our guest for Ask Us Anything About ADHD from Penn State Health. We welcome your questions and your comments. Just add them to the comment field below this Facebook post, and we’ll be sure to pose those questions here to the doctor. You talked a little bit about how ADHD is detected. Like, for example, in the classroom setting. So, there obviously is not a blood test or a clinical type test. It’s really behavioral things. Dr. James Waxmonsky – Mostly. We’re dealing with observations, interacting with the children, and most importantly, getting feedback from parents and teachers. The latter which can be a little bit challenging sometimes. But to call something a disorder, we want to hear that there’s impairment in the setting. So that’s why it’s really particularly critical to get not only feedback directly from parents about how their child is behaving, but particularly from teachers. Teachers are fantastic. They may not necessarily be experts on ADHD, but they know what a seven-year-old is supposed to be able to do in a 45-minute class. And if the child is not doing it, they get an asset marker of impairment. So, the standard of care, obviously interact with the child. You have parents fill out rating forms or complete an interview, and then you have the teacher fill out rating forms about both symptoms like hyperactivity and impulsivity; but most importantly, how actually is the child doing in the classroom? And if you have the symptoms then you have the impairment especially at home and school, we’re pretty comfortable making a diagnosis. You can get more high-tech, and we can run kids through EG’s, and you can actually MRI brains, and there is a kind of prototype of an ADHD brain. But the problem is it’s A, too expensive; B, there’s too much variability so you can’t definitively use it to say one child is ADHD and one child doesn’t. But you could take 100 kids with ADHD and 100 kids without ADHD, and you could see an average difference in their brain function, and that’s certainly true. Scott Gilbert – But imaging not necessary for diagnosis? Dr. James Waxmonsky – Oh, no. We don’t even recommend it. Really, rating scales, sitting down with kids. Your average pediatrician can largely establish the diagnosis. Scott Gilbert – What do we know and even not know about causes and risk factors for ADHD? Dr. James Waxmonsky – Yes. It’s a very good question. The brain is probably the most complex part of our bodies so it’s very challenging to understand exactly what causes ADHD. There are some clear risk factors. It is a hereditary disorder. So if you have a parent who had traits of it as a child or still has traits of it as an adult, you have maybe a one in five, one in four chance of having a child who has a disorder. A few things like nicotine exposure in utero. So smoking during pregnancy has been closely established as a risk factor. There’s a whole bunch of theorized things from pesticides to the most probably intensely debated one is modern media. So if you put infants and toddlers in front of too many screens, are we actually physiologically shortening their attention span? And that’s debatable. They’re certainly a value with monitor and screen time, but we’re not really clear yet if it’s causing ADHD in any way. Scott Gilbert – What do we know about the prevalence? I read online anywhere depending on the article you read, it could be 3%. It could be 12% of the population. Dr. James Waxmonsky – So most studies now will center around six to 7% including those from across countries. We use slightly different diagnostic criteria than some of the European countries. They tend to be a little bit more strict requiring hyperactivity. We don’t actually require it as long as you’re prominently inattentive. So that’s one of the reasons. And then one of the other — the thing to study to do, is they go out in the community and ask families, has your child been treated for ADHD? Have you ever been told your child is ADHD. Then that’s a bit different than a diagnosis. Those rates will push up to about 11ish percent, and then most importantly the rates of treatment are about 5%. So you go into a classroom and 5% of American school kids have been on medication for ADHD. Meaning that more than one in every classroom are probably going to have been treated at some point. Scott Gilbert – Then we’ll definitely talk more about treatments in a little bit here on Ask Us Anything About ADHD from Penn State Health. I’m Scott Dilbert. This is Dr. James Waxmonsky. He is chief of child psychiatry here at the Milton S. Hershey Medical Center, and he welcomes your questions about this topic whether you’re watching this video live or even if you’re watching it on playback. And regardless of how or when you’re watching it, please do click on the share button and share this content with other people in your feed to help get the word out about some of this important information. I would like to ask about back — I guess some people feel that ADHD is a relatively new diagnosis. So, it’s common for adults to say, “Well, back when I was a kid, there was no ADHD.” Was there and perhaps we just didn’t call it that? Dr. James Waxmonsky – Sure. Well, certainly there was. Whether or not this has become slightly more prevalent over the last several decades, it’s probably we’re getting better at diagnosing it, and again, we may debate things like modern media exposure, but certainly the prevalence was there when we go back. If you go back into — there’s German nursery rhymes for the turn of the 19th century that clearly show hyperactivity kids falling off walls and having all these awful things happen to them like many old-school nursery rhymes do. So, the construct was there. The original term was this one thing called minimum brain dysfunction which dates back to the 20s or 30s. The first treatment for it was back in the 1920s when they realized that stimulant medicines like Adderall, they were being given to treat pain post spinal taps, for headaches, and lo and behold the kids behaved better. So the actual treatments themselves date back 75 years. In the 50s, a small percent of kids were treated. And then over the course of the 80s and 90s, we really had a boom both in diagnosis and treatment, mostly because we got better treatments, and because we got more aware that it isn’t just a young kid disorder. It kind of hangs out and causes more problems later in life so we wanted to do more to identify it and treat it. Scott Gilbert – And so, we have talked a little bit about treatments. Let’s delve into those a bit more. What medications are out there that can help people with ADHD? Dr. James Waxmonsky – So, let me step back a second because we always tend to think of medications when we think of ADHD because everybody’s heard of Ritalin and Adderall for good or for bad. At the end of the day, behavioral treatments are just as helpful, and in many ways, possibly more useful than certain medications. Their preference is for kids who are very young who may have a hard time handling medications. And when you’re young, the behavioral treatments pull the parents in as much as the child because it’s very hard to teach a four-year-old a new skill. It’s much easier to work with their parent and help them kind of redirect the child [inaudible] and they consistently reward good behavior and the consequence of bad behavior. Scott Gilbert – I was wondering how much of it is training the parents to work with a child to help them through. Dr. James Waxmonsky – In young kids, that’s mostly it, and you can get as large effect for benefit for ADHD with the behavioral therapies as you can with the meds, and you have less side effects. The tradeoff is that it’s sometimes hard to find people who do those things, and then also, it takes time. The meds are wonderful in that they work right away. You get a visible reduction in hyperactivity. Kids can sit longer. They can stay focused longer on an activity, and that’s instantly, whereas the therapies obviously take time and effort. But when we look down the row when kids are older and when they’re better off for treatment, the behavioral treatments really start to have a clear benefit. Scott Gilbert – I imagine too that some parents too may have some concerns. Some very well-founded concerns about not wanting to rush to put their children on medication for something like this. Dr. James Waxmonsky – Yes. And we try to be very careful with the diagnosis. We want to make sure that the symptoms are persistent and causing impairment ideally at home and at school before we identify diagnosis. Secondly, we want to offer treatment that goes out for the impairment. So you can be hyperactive, but if it doesn’t really bother anybody, I don’t necessarily need you to be calmer. If you’re hyperactive that you’re disrupting your learning or other people’s learning, then we want to treat you. So linking the treatment to the actual problems the kids have probably works better. It’s easier to do with behavioral therapy because we can shape the treatment to go after whatever the problem is. The meds though are effective and they’re certainly a very reasonable part of treatment. They’re the most commonly used treatment. They significantly reduce hyperactivity. They significantly improve attention span. And they significantly improve impulsive behaviors whether they’re blurting out in class or whether they’re getting overly frustrated in the minute. Scott Gilbert – You’re watching Ask Us Anything about ADHD from Penn State Health. Dr. James Waxmonsky is chief of child psychiatry here at the Milton S. Hershey Medical Center. We welcome your questions. Stacey has entered a question here. She is asking ADHD and OCD, do the children grow out of these or are they on medication the rest of their lives? That’s a good question because we’re talking about children here, but, excuse me, what about the long-term? Dr. James Waxmonsky – Right. So, that’s a fantastic question, and starting with ADHD, if you asked this question 20 years ago the answer would have largely been yes. It kind of starts being a problem around middle school. But now we know when we start to track people actually longer, that what goes away is their physical hyperactivity. You can’t see me run around the run when I’m 30, but you can still see me struggle with inattention or being impulsive such as making quick and problematic decisions. So the visible symptoms go away a bit, but the more internal symptoms that actually caused most of the impairment hang out about two-thirds of the time. Now that doesn’t necessarily mean you need medication lifelong. In fact, with kids, we’re always looking for opportunities to see, “Hey, have they made enough development? Have they made enough gain? In fact, they don’t need meds.” But if you do need meds, they are largely safe developmentally and there are people who will use them all the way through their life, and they are just as helpful for adults as they are for young kids or teenagers. Scott Gilbert – Can having ADHD make someone more prone to other conditions? Dr. James Waxmonsky – Yes. And that’s — maybe not so much OCD per se, but certainly depression and anxiety. Substance use. Actually, the rates of cigarette use are much higher because sadly nicotine slightly improves your attention span. But you can imagine if you struggle in school, if you struggle to maintain friendships because other kids find you restless, impulsive, or inattentive, you’re going to get rejected more. And if you’re frustrating at home, you’re going to get punished more or even yelled at more, and that affects rates of depression, rates of anxiety, and can lead to things like school dropout and substance abuse later into adolescence. Now, that’s not necessarily the course for everybody, but we know that both those disorders and the things that we don’t want our kids to do like quit school or get arrested or use drugs are a little more likely with ADHD. Not gigantic risks, but those are the things that we do have to watch for. Scott Gilbert – If parents suspect that their child may have ADHD, what’s a good next step? Should they speak with their primary care provider or reach directly out to a specialist? Dr. James Waxmonsky – In most cases, it makes sense to reach out to your primary care provider. ADHD is like the ear infections of child mental health. Almost every primary care provider sees it on a regular basis. They are aware of the treatments. Many of them are comfortable with the medication treatments, and some of them know where to find the behavioral treatments. Here at Penn State Hershey and Pediatrics, we have — our pediatricians are excellent at this. We have good awareness about the meds and the behavioral treatments, and also, we have specialists imbedded right within primary care so you can work with a mental health professional in the same place you go to get your vaccinations for your child. Not every place has that; but yes, starting with a primary care doc is a very good bet. If for some reason that’s not your preference, you can reach out to a specialist, and this is where our field gets confusing. I’m a psychiatrist which means I’m a medical doctor, which means I happen to do behavioral treatment because I think it’s important. But most psychiatrists will focus on assessment and medications; whereas, counselors, social workers, therapists will be behavioral based, and it really depends on what treatment you want to start with where you go, and there is no best answer. It’s partly more what you’re comfortable with and what your child is comfortable with. Scott Gilbert – Sounds good. And of course, we will put a link below this Facebook post to the division of child psychiatry here at the Milton S. Hershey Medical Center. So if you have some questions, you can reach out to Dr. Waxmonsky’s division, and thanks a lot for your time today. It was good talking with you. Anything else to add as we bring things to a close? Dr. James Waxmonsky – I would mention that certainly some kids don’t respond to initial treatments, and for those particularly interested in using behavioral treatments, it really is one of the focuses of our division here at Penn State Hershey so that we have a broad number of counseling programs, behavioral interventions, and even medication treatments that are available through families. And our information is on the website if you’d look under the children’s hospital or Penn State Psychiatry, we have a wide range of treatments that would fit, I think, every family. So please look us up. Scott Gilbert – It sounds good. Dr. James Waxmonsky is chief of child psychiatry here at the Milton S. Hershey Medical Center, and he’s been our guest today. Thank you so much for watching and feel free to add your questions again whether you’re watching this live or on video playback, we’ll get answers to your questions about ADHD from Dr. Waxmonsky. 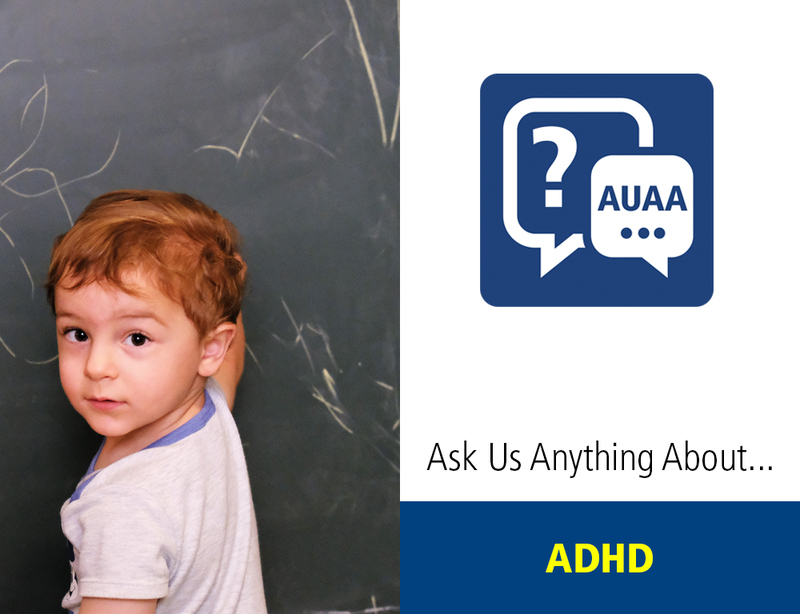 Thanks for watching Ask Us Anything About ADHD from Penn State Health.